"They ask thee (O Muhammad) what is made lawful for them. Say: (all) good things are made lawful for you. And those beasts and birds of prey which ye have trained as hounds are trained, ye teach them that which Allah taught you; so eat of that which they catch for you and mention Allah's name upon it, and observe your duty to Allah. Lo! Allah is swift to take account (5:4)." Meat is prepared in many ways, as steaks, in stews, or as dried meat. It may be ground then formed into patties (as burgers or croquettes), loaves, or sausages, or used in loose form (as in "sloppy joe" or Bolognese sauce). Some meats are cured, by smoking, pickling, preserving in salt or brine. Others are marinated and barbecued, or simply boiled, roasted, or fried. Meat is generally eaten cooked, but there are many traditional recipes that call for raw beef, veal or fish. Meat is often spiced or seasoned, as in most sausages. Meat dishes are usually described by their source (animal and part of body) and method of preparation. 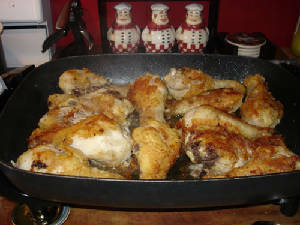 Because of its relatively low cost among meats, chicken is one of the most used meats in the world. Nearly all parts of the bird can be used for food, and the meat is cooked in many different ways around the world. Popular chicken dishes include fried chicken, chicken soup, marinated chicken wings, tandoori chicken, butter chicken, and chicken rice. 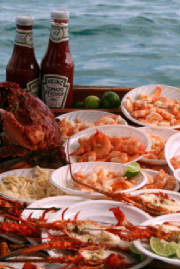 Seafood is any sea animal or seaweed that is served as food or is suitable for eating. This usually includes seawater animals, such as fish and shellfish (including mollusks and crustaceans). By extension, in North America although not generally in the United Kingdom, the term seafood is also applied to similar animals from fresh water and all edible aquatic animals are collectively referred to as seafood. From basic roasted leg of lamb to exotic dishes, your cooking options abound. Lamb shanks, a relatively inexpensive cut, cooks up heavenly in the crockpot. 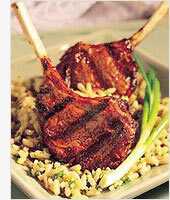 Many folks serve lamb with mint jelly, an old custom originally used to disguise the strong flavor of mutton. Beef Cooking and Buying Tips: Click to View or Add Text.